Recently, I had the chance to taste through many 2004 white burgs and while I am not an expert in this field to the extent of a burghound it is a personal fascination of mine and a white I am inclined to drink. So, since our publication focuses on a very different area of wine, I am more than happy to write about my white burgundy experiences here. The 2004s are shaping up to be a very fine vintage indeed. Very nice, classically structured and flavored wines across the board. I was sorely disappointed in the 2003s and have avoided them on more than one occasion. And now that it is bookended by both the amazing 2002 and the fine 2004, it looks like 2003 is destined to be a favorite of the cherrypickers. I am sure there will be some outstanding values in 2003 and if I find any I'll let you know. 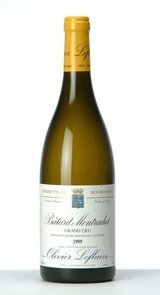 Now, while your winemonkey certainly likes his Batard-Montrachet, they come few and far between so what I am talking about here is the likeability of so many of the "lesser" and outlying areas. For example, Olivier Leflaive's wines were outstanding from top to bottom. Now the top is expected to be outstanding. Enough said. But, I have found that the wines toward the value end of the Leflaive portfolio gets lost in the shuffle and are just a tad too simple. In 2004, however, I feel like that is not the case. The basic stuff is a just a notch up and I feel like I am getting a really nice bottle for the price. Now if you don't expect Montrachet in a bottle of St. Veran I think you will do well so drink up. Bonneau de Martray- when I think Corton Charlemagne, I think BdM.